A reflection of God’s desire. and causing the occasional fracture. After the death of his old friend, Albert Einstein said “Now Besso has departed from this strange world a little ahead of me. New evidence continues to suggest that Einstein was right, death is an illusion. Our classical way of thinking is based on the belief that the world has an objective observer-independent existence. But a long list of experiments shows just the opposite. We think life is just the activity of carbon and an admixture of molecules: we live awhile and then rot into the ground. We believe in death because we’ve been taught we die. Also, of course, because we associate ourselves with our body and we know bodies die. End of story. But biocentrism, a new theory of everything, tells us death may not be the terminal event we think. Amazingly, if you add life and consciousness to the equation, you can explain some of the biggest puzzles of science. For instance, it becomes clear why space and time – and even the properties of matter itself – depend on the observer. It also becomes clear why the laws, forces, and constants of the universe appear to be exquisitely fine-tuned for the existence of life. Until we recognize the Universe in our heads, attempts to understand reality will remain a road to nowhere. Dr. Lanza selected as one of Prospect Magazine’s “World Thinkers 2015.” The thinkers were chosen for “engaging in original and profound ways with the central questions of the world today. In truth, you can’t see anything through the bone that surrounds your brain. Your eyes are not portals to the world. Everything you see and experience right now‚ even your body, is a whirl of information occurring in your mind. According to biocentrism, space and time aren’t the hard, cold objects we think. Wave your hand through the air – if you take everything away, what’s left? Nothing. The same thing applies for time. Space and time are simply the tools for putting everything together. it’s like a perennial flower that returns to bloom in the multiverse. Death is Only the Beginning If death doesn’t exist, then what happened to your dog? – the meaning is in the lyrics. Experiments suggest your past isn’t set in stone. Evidence suggests time simply reboots. 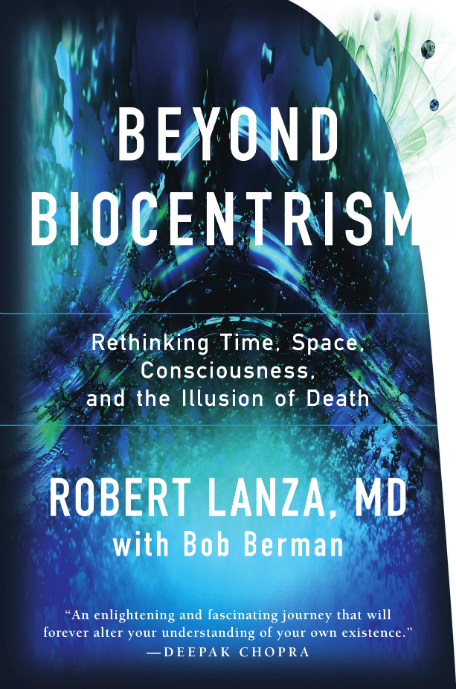 Listen to an excerpt from Dr. Robert Lanza’s recent talk at the Hazy Moon Zen Center. Longing for Tomorrow surpasses all expressions.